Dudley Danoff, MD, FACS, is a graduate of Princeton University and Yale University Medical School. He has taught on the clinical faculty of the UCLA School of Medicine for more than 25 years and is the founder and president of the prestigious Cedars-Sinai Medical Center Tower Urology Group in Los Angeles. Urologist to many Hollywood stars and the recipient of national and international honors, Dr. Danoff is also senior attending urologist at the Saban Los Angeles Free Clinic. 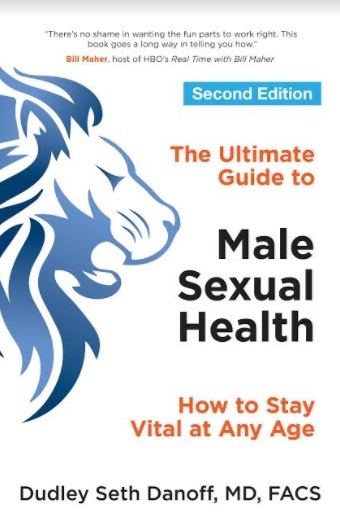 He is also the author of The Ultimate Guide to Male Sexual Health: How to Stay Vital at Any Age. For more than fifty years, I have been extremely fortunate and blessed to practice medicine, and I have not only enjoyed every moment of the experience but have excelled at the craft of being a urologic surgeon. I had no idea what my God-given skill set was when I was a resident surgeon in training, but somehow, probably by pure luck, I had the exact skills needed to be a superb urologic surgeon—making my professional career gratifying and enormously successful. I would like to think that another thing I do best is be a super husband, father, and grandfather. Discipline. I don’t know where I learned it, but discipline has been the hallmark of both my personal life and career as a urologic surgeon. I can proudly say that in more than fifty years, I have never taken a single unplanned day off in my practice. Another thing that makes me the best version of myself is that my attitude is very positive—I keep a “glass half full” outlook with a smile on my face. I pride myself in never exhibiting an iota of negativity in my interactions with patients, friends, or family. The power of positive thinking is my mantra. I am in the twilight of my long professional career as a urologic surgeon. Looking back, my aspirations were to finish the race about the way I started it, and I certainly have succeeded in that. I’ve met my goals, both professional and personal, and fulfilled all my desires. At this point in my life, I feel that any quality time I have left in which I can exercise my talents is like “found money.” I want to continue to give back, and it seems that the more I give of myself to others, the more gratified I become. Many would say building a “urologic empire” is my biggest success, but I don’t see it that way. My biggest success is that, for more than fifty years in active surgical practice, I have succeeded at being gracious, kind, and compassionate, and I’ve used my abilities to give something back to the global community, allowing me to live “the dream.” I had the foresight to create an acclaimed and unique urologic practice at one of the great medical institutions in the United States. I’m originally from the depths of Brooklyn, and I was lucky to obtain perhaps the world’s finest education at Princeton University and then to rise to the top of my class in medical school at Yale University. To round out my educational success, I trained at Columbia University College of Physicians and Surgeons. I also served in the United States Air Force with the rank of major. This is a tough question. There have been many challenging and life-threatening moments in dealing with critically ill patients in my surgical career, but at the end of the day, what comes to mind is deciding to ask a beautiful woman to marry me. I was a young doctor and an Ivy League graduate who fell in love with a Yemenite singer from Israel. I saw something in her that I believe others, including my beloved father, did not see. I remember telling my father that I was going to marry this woman, and he was negative, threatening to not attend my wedding. I told him, “Pops, I can assure you that if you do not attend my wedding, your grandchildren will not love you any less.” The proof is in the pudding, and forty-six years after that grim encounter, I am still married to one of the greatest people in the world. We are blessed with two successful children and three grandchildren. It was a challenge for me to defy the wisdom (or lack thereof) of the folks around me when I proposed to my wife. I believe I overcame the challenge of a negative environment and made the right decision. “Accept what you must and change what you can and be smart enough to know the difference.” As I interpret it, you get up in the morning and give everything your best shot all day long, a 100 percent effort. At the end of the day, you’ll have succeeded in some tasks and failed at others. As long as you give everything your absolute best effort, you can sleep soundly at night knowing that “stuff” happens—but not because you failed to do your best. No looking back and no worrying about who is catching up to you, because none of that matters. Do the best that you can and then sleep like a baby every night of your adult life (perhaps after two glasses of good wine and a Cuban cigar). Generally, I am most drawn to creative people, whether their creativity manifests itself in art, entertainment, agronomy, astronomy, physics, fiction, cuisine, and so on. I love to be surrounded by people whose minds are racing like a bullet train through uncharted terrain. However, I also enjoy my own company. I look in the mirror, and I like what I see. I am ecstatic in my work, I am confident in my accomplishments, and I have no jealously, hatred, or avarice toward anyone. I could be locked in a dark room for days and still not let the smile fade from my face. To be surrounded by patients, family, friends, and admirers is a definite plus, but in the end, I can be a whole, fulfilled person even without them. My wife has had an extremely successful career for more than sixty years in her home country of Israel as a highly regarded entertainer, so we’ve had the opportunity to travel to many exotic places throughout the world. I always love to return to Israel, however, which I perceive as the “ancient” center of the world. It is historically fascinating and is home to multiple religions, ethnicities, and ideas. It has the warm Mediterranean waters, beautiful white sand, picturesque mountains, breathtaking deserts, and—above all—a joyous populace that never ceases to amaze me with their sense of positivity in the face of existential challenges. I have never been to a country where the culture, including the music, art, theater, cuisine, and creativity, is so joyful. Israel is a unique and special place. Other than my favorite putter, my favorite object is an instrument that I use in my professional career called a cystoscope, which is a unique telescopic camera that’s inserted into the body and allows inspection of its interior. The cytoscope is also a surgical manipulation tool because it has a special scope that reaches parts of the body formally accessible only by a surgical incision. This instrument was invented long before any of the modern endoscopic surgical instruments and is the “grandfather” of virtually all the current miracles of noninvasive surgical procedures practiced today. My current passion is to live every moment of my remaining time with joy, enthusiasm, and positivity. At this point in both my life and career, ill winds are certainly on the horizon, but I hope—and it is my passion—to live life to the fullest until my last breath. Above all, I want to avoid any negativity or pessimism as I approach the future.